Founder and CEO of the NGO Positive Runway, Justina Mutale was admitted to the UK’s Black 100+ Hall of Fame in July last year. The project sets out to identify top black achievers in Britain and we were not at all surprised to see her included. 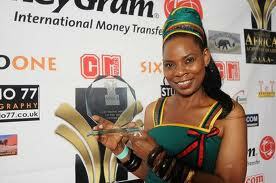 A Zambian, she was the first person from Southern/Eastern Africa to be included in the Hall. Most members go on to be mentioned in the UK Honours List. Positive Runway was set up to fight HIV/Aids and tours the world leveraging the popularity of beauty, fashion, music and celebrity. The organisation benefits from Justina’s event management skills which were learned at the Commonwealth Secretariat and, of course, her undeniable good looks. The Miss Zamba Pageant has been designed by Justina Mutale as ‘Beauty with Purpose’ with winners raising funds to support children orphaned by AIDS. Positive Runway is represented in 40 countries across six continents. In June this year, Ms. Mutale, who is also Diaspora Ambassador & Spokesperson of the Enough Food for Everyone If campaign, delivered a letter to David Cameron outlining views of what should be considered at the G8 summit in terms of food security.